For the former Australian rules football player, see Noel Clarke (footballer). Noel Anthony Clarke (born 6 December 1975) is an English actor, screenwriter, director, and comic book writer from London. He is known for playing Wyman Norris in Auf Wiedersehen, Pet and Mickey Smith in Doctor Who. Clarke appeared in and wrote the screenplay for Kidulthood and wrote, directed, and starred in the sequels, Adulthood and Brotherhood, which earned £1,209,319 during the opening weekend of its release. Clarke studied Media at the University of North London before going on to take acting classes at London's Actors Centre. Clarke won the Laurence Olivier Award for Most Promising Performer in 2003 and was awarded a BAFTA Orange Rising Star Award in 2009. He has had recurring television roles as Wyman Norris in the revived series of Auf Wiedersehen, Pet (2002–2004) and as Mickey Smith in the first two series of the revival of the BBC science-fiction series Doctor Who (2005–2006). He became the series' first black companion in the episode "School Reunion", and reprised his role as Mickey in the episode "Journey's End" in 2008 and in 2010 in "The End of Time" Part 2, and also starred in the Doctor Who audio series Dalek Empire: The Fearless, which was released from September to December 2007. His other television work includes appearances in Casualty and Metrosexuality. He has also acted on the stage, and won the Laurence Olivier Award for "Most Promising Newcomer" in 2003 for his performance in the play Where Do We Live at the Royal Court Theatre. Clarke starred in the film Doghouse, directed by Jake West and produced by Carnaby Films International. The film was shot primarily in Midhurst, a small town in West Sussex, on the grounds of the old King Edward VII Hospital. He also participated in Neil Marshall's film Centurion, about which Clarke said, "it's about the Roman Legion and I'm one of the soldiers". Clarke began his writing career in 2005 when he wrote the screenplay for the film Kidulthood which was released in 2006. He also directed and starred in the sequel, Adulthood, which was released in 2008. On directing his first film, Clarke described his experience, "Directing for the first time was definitely a challenge and tiring at times. It was a steep learning curve and if you're willing to do stuff and go with it, then it pays off." His other writing credits include "Combat" which is an episode of the Doctor Who spin-off series Torchwood, and West 10 LDN, a pilot for BBC Three which is about kids on a rough housing estate. In 2008, he starred in the video for The Prodigy single "Invaders Must Die". In 2009, Clarke was awarded a BAFTA award in the category of Orange Rising Star Award. As a result of the success of Kidulthood, Adulthood, and his BAFTA win, he was ranked at number 83 in the MediaGuardian 100, an annual ranking of media people in The Guardian. He also played the role of A.J., opposite Jim Sturgess, in Philip Ridley's cult film, Heartless. Clarke has worked with BBC Blast, a project for teenagers that aims to inspire and get people being creative. Shortly after his BAFTA win he gave a talk to inspire young people telling them to "broaden your mind". His next project, 4.3.2.1., a heist movie, was released on 2 June 2010, and starred Tamsin Egerton, Emma Roberts and Adam Deacon. The film was shot in London and New York. He has also played an uncredited role in 2012's Ghost Rider: Spirit of Vengeance as a priest. The scene was cut from the movie, but can be seen in the Deleted Scenes in the Special Features of the DVD. He played Thomas Harewood in Star Trek Into Darkness, a family man with a wife and a young daughter. The film was released on 15 May 2013. In 2015, Clarke created a short-lived superhero series The Troop for Titan Comics. The first issue was released in December 2015, and received critical acclaim. In 2016, Clarke wrote, directed, and starred in Brotherhood, a sequel to Adulthood that went on to earn £1.98m in its opening week. 2006 Torchwood Writer of episode: "'Combat"
2017 Urban Myths Muhammed Ali Episode: "The Greatest. Of All Time." 2018 Inside No. 9 Gordon Episode: "And the Winner Is..."
^ Witherow, John, ed. (6 December 2018). "Birthdays". The Times (72711). p. 33. ISSN 0140-0460. ^ Luxford, James (19 June 2008). "Noel Clarke Talks Adulthood". Entertainmentwise. Retrieved 23 October 2008. ^ "Noel Clarke answers questions on his film Adulthood". Daily Mirror. 10 October 2008. Retrieved 23 October 2008. ^ MacNab, Geoffrey (27 June 2008). "Hit makers: The real stars of British film". The Independent. London. Archived from the original on 5 July 2008. Retrieved 22 October 2008. ^ Machell, Ben (21 June 2008). "Noel Clarke on Adulthood and avoiding trouble". The Times. London. Archived from the original on 16 June 2011. Retrieved 23 October 2008. ^ "Film Winners in 2009". BAFTA. Archived from the original on 16 July 2009. Retrieved 8 February 2009. ^ Cooper, Jarrod (26 August 2007). "Fearless set for September release". Archived from the original on 6 December 2007. Retrieved 27 August 2007. ^ Realf, Maria (16 February 2009). "A rising star is born: BAFTA winner Noel Clarke talks about his recent win, future projects and a desire for weird fan mail". EyeForFilm.co.uk. Retrieved 16 February 2009. ^ "Noel Clarke Interview". Female First. 9 June 2008. Retrieved 23 October 2008. ^ "The Prodigy Return: "Invaders Must Die"". BoraMag. 27 November 2008. Archived from the original on 25 April 2012. Retrieved 28 November 2008. ^ Staff (13 July 2009). "83. Noel Clarke". The Guardian. London. Retrieved 13 July 2009. ^ "Noel Clarke". BBC Blast. Retrieved 10 September 2017. ^ "4, 3, 2, 1 The Movie". 4321themovie.com. Archived from the original on 27 October 2009. ^ "Star Trek Sequel Cast Coming Together". Star Trek.com. 7 January 2012. Retrieved 10 September 2017. ^ Wharfe, Chris (5 January 2012). "Noel Clarke Joins Star Trek 2 Cast". The Hollywood News.com. Retrieved 10 September 2017. ^ Mendoza, Nadia (5 January 2012). "Beam me up, Benedict! Sherlock actor Cumberbatch joins Star Trek sequel with Noel Clarke". The Daily Mail. London. ^ Melidoneas, Bill (24 November 2011). "STAR TREK sequel finally gets release date: May 17, 2013". VeryAware.com. Archived from the original on 26 November 2011. ^ "The Troop #1 (Preview)". Comic Book Resources.com. 30 November 2015. Retrieved 10 September 2017. ^ Fuller, Dean (9 December 2015). "'The Troop #1' Review (Titan Comics)". Nerdly.co.uk. Retrieved 10 September 2017. ^ Norman, David (4 December 2015). "Comic Book Review: The Troop #1". Clandestine Critic. Retrieved 10 September 2017. ^ the1whoknocks (8 December 2015). "Advanced Review of The Troop #1". Nothing But Comics.net. Retrieved 10 September 2017. ^ "The Troop #1 Reviews". Comic Book Roundup.com. Archived from the original on 10 September 2017. Retrieved 10 September 2017. ^ Gant, Charles (6 September 2016). "Brotherhood the daddy at UK box office as Finding Dory crowned king of the summer". The Guardian. Retrieved 13 September 2016. ^ "Noel Clarke to complete Kidulthood trilogy with Brotherhood". The Guardian. 13 November 2015. Retrieved 10 September 2017. 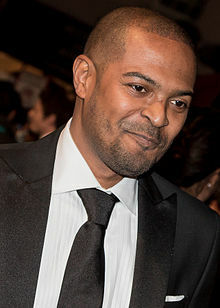 Wikimedia Commons has media related to Noel Clarke.